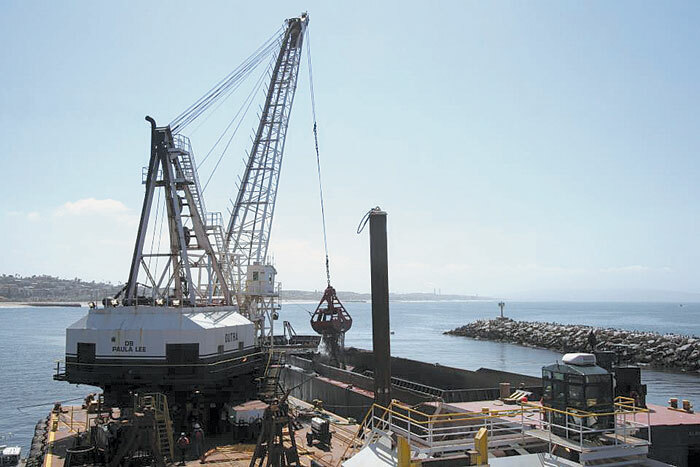 MARINA DEL REY — Rep. Henry A. Waxman (D-Venice) has urged the Army Corps of Engineers to initiate regular maintenance dredging of the harbor, in a written request on June 6. In a letter addressed to Gen. Thomas Bostick, commanding general of the Army Corps of Engineers, Rep Waxman stated that, as the largest man-made small craft harbor in the U.S., Marina del Rey needs to be dredged on a regular basis. There should be no more 11-year intervals between dredging projects. Home to more than 5,000 boats, the harbor is an “anchor for tourism, recreation and public safety in Los Angeles” and it should be maintained more consistently, the letter stated. The county is seeking maintenance dredging every three to five years, to ensure that the harbor’s entrance channel is kept clear of silt. The marina’s major dredging projects occurred in 1999, in 2007 (when 327,000 cubic yards of sediment was dredged) and again in 2009 (when 6,500 cubic yards was removed from the harbor). The most recent dredging occurred in 2012, when the Corps of Engineers removed about 800,000 cubic yards of sediments and dug the harbor to a depth of 20 feet at the northern entrance. Boaters and other harbor users experienced many negative effects of 11 years of non-dredging projects. These safety concerns were also addressed in Rep. Waxman’s letter to the Corps of Engineers. ← Will Back Bay Kayakers Need a $4.32 Lands Pass?